When does a writer become a real writer officially? It is a question that I have been thinking about for about ten years, although I didn’t publish my first book until 2012. I have written all my life, but I never considered a career as a writer. Nobody in my family was a writer and I did not know any writers. In short, I had no idea what constitutes a writer, leave alone an author. However, I have always ‘written’: when I was in school, I had to write essays; when I was in university, I had to write lots and I had to write letters home too. As I moved around Europe, I wrote to friends, family and girlfriends and I was always told that people looked forward to reading my letters because they sounded ‘as if I were talking to them face to face’. In person. I don’t know about that, but that is what was said. Anyway, one day, I found myself living in Thailand. I felt very isolated and had no-one to talk to, so I began writing more. Compliments kept coming in. Rather than repeat myself in various letters, I started web sites and blogs and it still went well, even though most of my readers had never met me. Does one become a writer at that point? It never crossed my mind. I was writing at least 1,000 words a day and thought nothing of it. In 2010, I wrote 1,200,00 words. Did that make me a writer? I didn’t know. 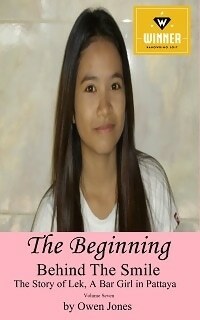 Meanwhile, I had been writing a book called ‘Behind The Smile – the story of Lek, a Bar Girl in Pattaya.’ When I had finished it, I took the traditional route of publishing, not knowing that there was an alternative. My research had taught me that etiquette demanded that I approach one agent or publisher at a time and wait three months for a reply. I complied and wasted a whole year. I will never forgive them. Then I read an article on self-publishing and I realised that as an unknown with no influential friends, the traditional route was closed to me. You need contacts, friends in the right places. So I went the self-publishing route, but I still had nagging doubts. Was I a writer now that I had a one novel published? Not like the pros, eh? I was an interloper into the world of ‘real writers’, wasn’t I? Well, that is hard to judge for oneself. Maybe anyone can write one book, so does having written two make you a writer? Can you then put in your passport ‘Professional Writer’ or even ‘Author’? If you write and can sell your work then you are a writer, or an author, whether you are backed by a poncey publisher to distribute your work or not! Copied from Owen’s Personal Blog with kind permission.